Professional Practices and Responsibilities (PPR) - a compulsory online course for new and revalidating RYA Commercial Endorsement holders applicable from April 2012. Duration: Allow approx 10 hour completion time. Commercial environment - showing how you fit into the professional maritime world. Vessel – teaching about the compulsory carriage and maintenance of safety equipment and how to create and implement risk control and operating procedures. Gives you a working knowledge and understanding of the commercial environment, as well as your responsibilities as a professional. 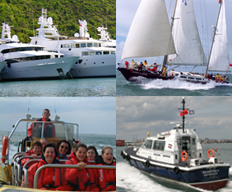 The PPR course is an online course taken through RYA Interactive. Findhorn Marina provides you with remote access to an instructor who will be on hand to help if you have any queries during the online course. To register for the PPR E-Learning course first contact us on 01309 690099 so we can issue you with RYA Interactive E-Learning login details to get you started.